Alright, first things first. I am not the best person to review the latest two entries in the Planet of the Apes franchise, partly because I never cared much for the original films, but mostly because I thought Tim Burton’s 2001 remake was dreadful. So when Hollywood decided it was time for another reboot, I was leery. I’ve been asking my friend The Stillness – an avowed fanatic of all things Apes – to put aside his excellent music blog for a while so that he can write the definitive analysis on this long-running sci-fi series. Until then, here are my brief comments on Rise of the Planet of the Apes (2011) and Dawn of the Planet of the Apes (2014). Rise of the Planet of the Apes is similar to 1972’s Conquest of the Planet of the Apes in that it’s an origin story, showing us how the apes initially revolted against the humans. Will Rodman (James Franco) is a scientist working on a drug to cure Alzheimer’s Disease. Experimenting on chimpanzees, he realizes the drug is making the apes smarter. One of the chimps has a baby, which Will names Caesar and ends up raising as if it was his own son. The years pass and Caesar develops into a highly intelligent and sensitive primate, capable of complex thoughts and emotions. 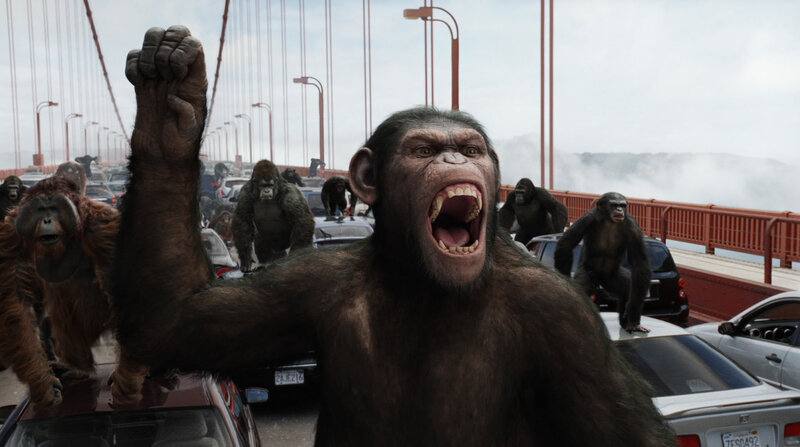 Eventually, Caesar realizes the danger humans pose to his species, rebels, and leads a horde of apes across the Golden Gate Bridge, escaping to San Francisco’s Muir Woods. The film ends with a montage where we discover Will’s cure not only has made the apes evolve, it will also wipe out most of mankind. The film is entertaining but not great by any means. The filmmakers do create a wonderful character in Caesar (played by Andy Serkis), but the script and performances are kind of weak: David Oyelowo is laughably over-the-top as Will’s boss, and the relationship between Will and love interest Caroline (Freida Pinto) superficial at best. I also find the motion capture and CG a bit clunky, specially during a last sequence where the apes escape across the city. Still, not a bad way to jumpstart the franchise again. And, it makes you forget about Burton’s version, so win-win. Now, Dawn of the Planet of the Apes is another story. This is the movie I was expecting to see the first time around. Set ten years after Rise of the Planet of the Apes, it focuses on the new world of the simians, letting us see how their society has prospered. It’s a slower, more thought-out film – one which opens and closes with a close-up of Caesar’s expressive face as he bears witness to how his carefully constructed community erupts in anger, dissension, betrayal. It pits humans against apes in a struggle for the survival of each species. And it does so with a welcome economy of bombast and emphasis on dialogue and intrigue. If Rise of the Planet of the Apes was an action movie, this one is more of a suspense drama… and it makes all the difference for me. 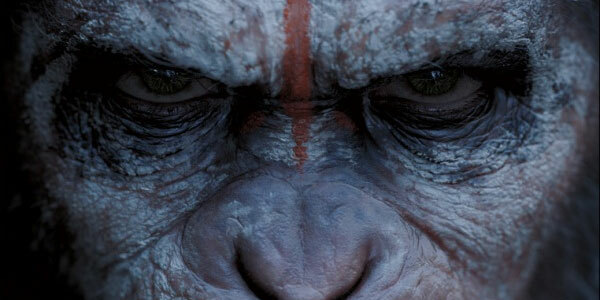 Plus this time around, the CG is top-notch: Halfway through, I pretty much stopped seeing the digital apes altogether. Dawn of the Planet of the Apes is not without its faults: The humans are still underdeveloped, getting short shrift next to the (admittedly) more interesting apes. But it takes the franchise in a direction I’m excited about for the first time. Hope the next one keeps it up.